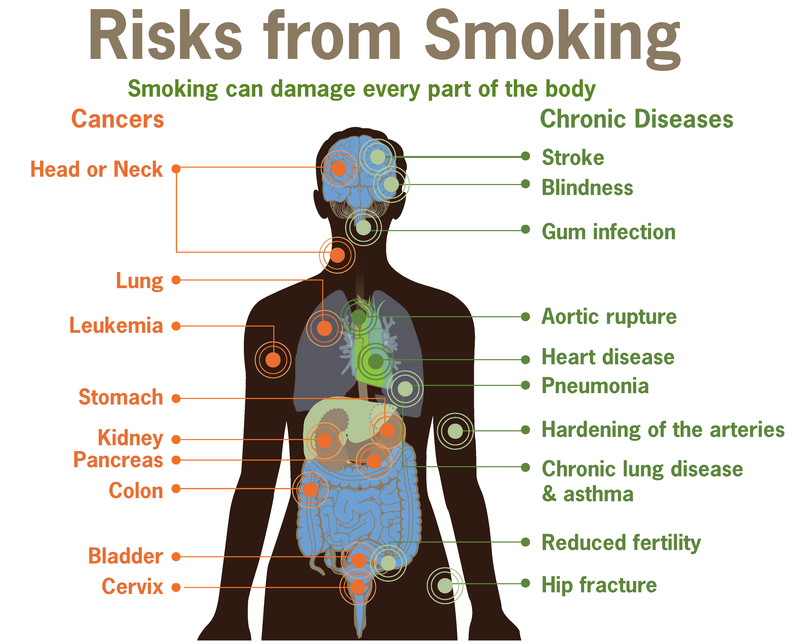 The health risks of smoking cigarettes and other tobacco products are well understood. But in iGCSE exams, it can sometimes be difficult to work out exactly how much detail the examiner wants, especially on an open-ended question. This blog post is an attempt to demonstrate some of the key areas of understanding that you should be aiming to show in your answers. Cigarettes contain a wide variety of toxic chemicals: you should focus your understanding on three examples. Nicotine is the stimulant drug found in cigarette smoke and also the reason smokers can easily become dependent on smoking. Nicotine is rapidly absorbed into the blood in the lungs and it causes an increase in heart rate, an increase in blood pressure and the release of the hormone adrenaline (which has similar effects). Carbon Monoxide is a poisonous gas that is produced whenever there is incomplete combustion of biological material. 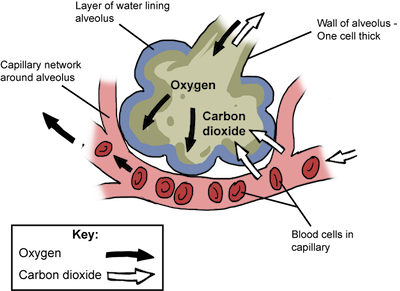 Carbon monoxide binds to haemoglobin in the red blood cells in place of oxygen and so the smoker will be transporting less oxygen in her blood, and this leads to a whole load of implications for health. Tar is the name given to a large number of different chemicals found in cigarette smoke. Tar forms droplets in the smoke which can condense in the airways and alveoli. Many of the chemicals in Tar are carcinogens – that means they promote the formation of cancer. Tar also damages the cilia in the trachea and bronchi and makes the thin walls of the alveoli lose their elasticity and so damage more easily. 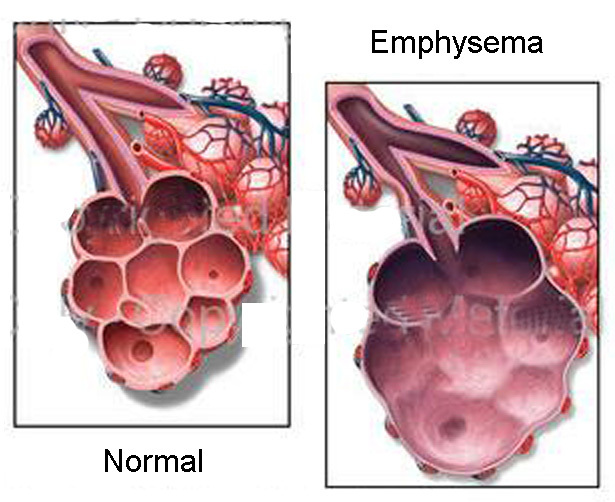 Emphysema is a disease in which the thin walls of the alveoli break down. Tar droplets condense onto the alveolar wall, making them rigid and inflexible. Smokers are coughing a great deal to remove the mucus from their lungs and this coughing can cause the sticky, rigid tar coated alveolar wall to degenerate. 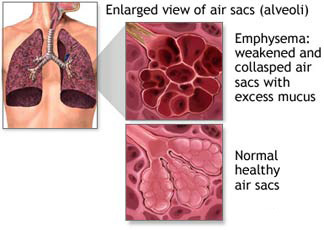 A patient with emphysema will have a greatly reduced surface area for gas exchange due to all the collapsed alveoli. So the diffusion of oxygen into the blood would be reduced causing breathlessness and impacting health. 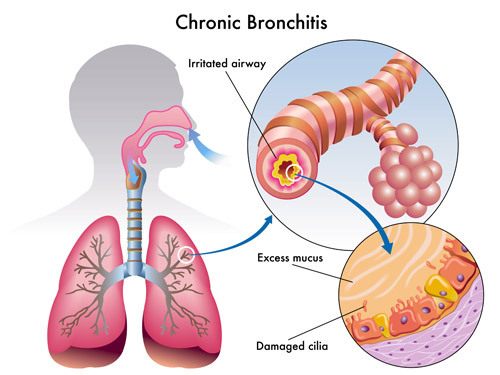 The bronchi can become inflamed and narrowed due to the overproduction of mucus and the fact that the muco-ciliary escalator does not function to waft mucus up the bronchi. 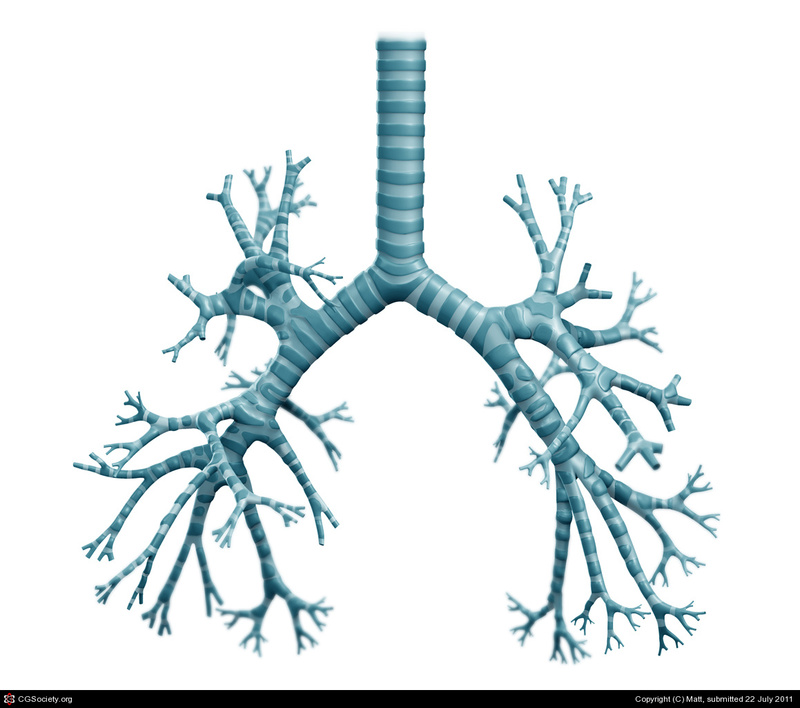 A narrowed bronchus makes breathing harder and compounds the problems of emphysema described above. It also promotes coughing which damages the alveoli still further. Carcinogens in cigarette smoke can make it much more likely that cells in the lungs and airways develop mutations that lead to cancer. Cancer is a disease in which cells start to divide out of control to form a tumour and then cells in the tumour break off and travel round the bloodstream to form secondary tumours elsewhere in the body. 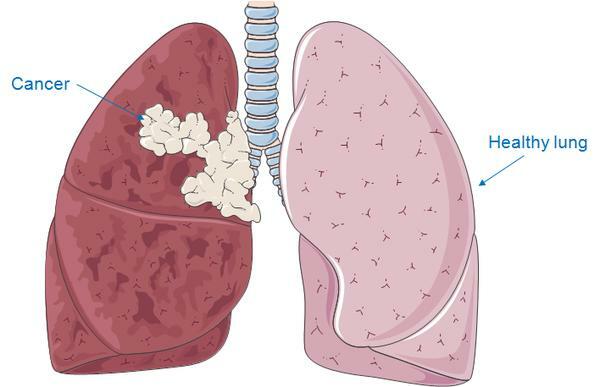 Lung cancers can be hard to treat and are a common cause of early death in cigarette smokers. 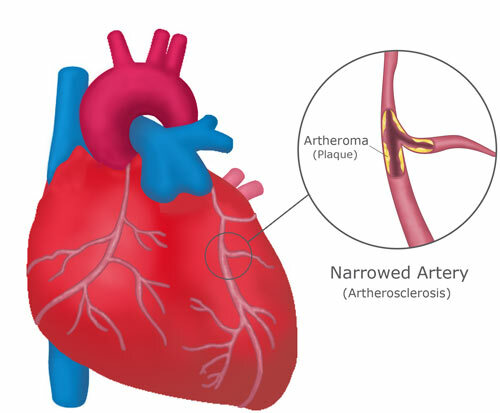 CHD is a disease in which the arteries that supply the cardiac muscle in the heart (the coronary arteries) get narrowed due to the build up of fatty plaque in their walls. This is a condition called atherosclerosis. 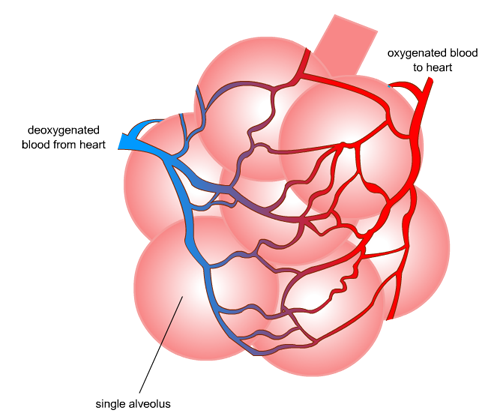 A narrowed coronary artery means that an area of cardiac muscle is starved of oxygen and so can die. 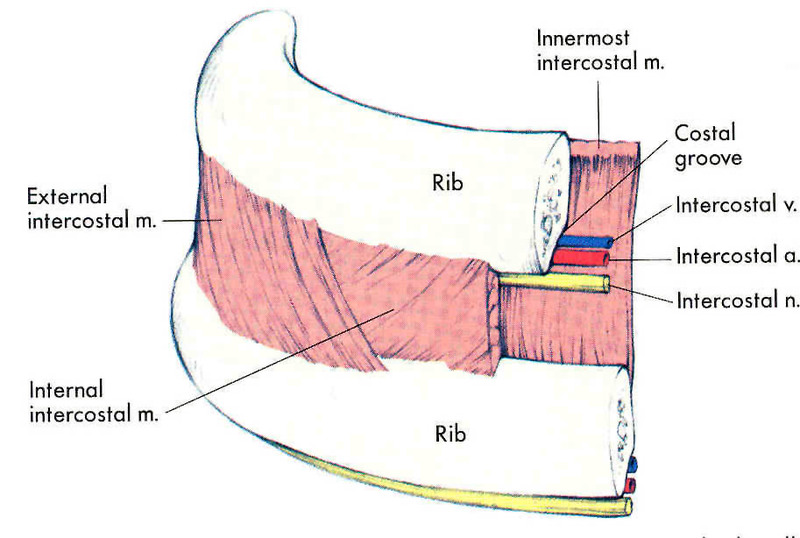 This may interfere with the electrical coordination of the heart beat causing a cardiac arrest or heart attack. Patients who smoke have a higher blood pressure than normal due to the stimulant effects of nicotine. A high blood pressure makes the early damage to the arterial lining more likely as well as making the blood more likely to clot. Blood clots form in the final stages of the disease around the plaque and can complete block the blood vessel. CHD is a major cause of death across the world and it is well known that stopping smoking can do a great deal to lower a patient’s risk of this potentially deadly disease.